well I am suffering to get the developer account …evrytime it keeps saying that my credit card is not valid..and it is valid and they do charge my card!!! do you have any help tips…or can you suggest a solution instead of creating this account…all i need is to register my device!!!! Hey mate. 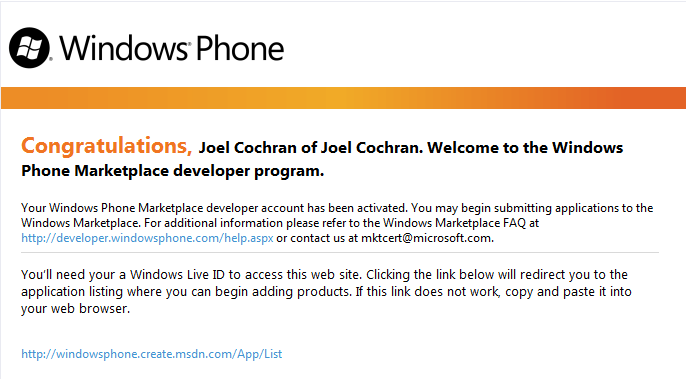 Is it possible to code for my own WP7 device without registering to Apps HUB ? I don’t want to publish my apps, just code for myself. Yes, you can unlock up to three devices for your own use. This is also how you can test apps on a device (not just the emulator) before submitting them to the marketplace. Here is an article that should help. I have a problem with my windows 7 Personal computer. Is there a strategy to automatic sign on to my user account if i’ve a pasword on it? I would appreciate any assist!